Boise natives Joan H. and John B. Carley spent twenty years wintering in the Southwest. Their love of the region and the various cultures represented there led them to begin collecting art by Native American artists. They eventually amassed a collection of more than sixty-five objects, including ceramics, sculptures, and textiles. In 2016, the Carleys generously gifted their collection to the Boise Art Museum. The collection consists of artworks by Apache, Choctaw, Hopi, Navajo, Pueblo, Tohono O’odham, and Wyandot artists. Highlights include an early twentieth-century jar from the Acoma Pueblo, a series of black vessels by acclaimed San Ildefonso Pueblo artist Maria Martinez, several storyteller figures from Cochiti Pueblo artists, and various intricately patterned Navajo wool rugs. 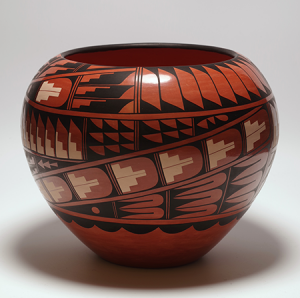 IMAGE: Nanette Loretto, Jemez Pueblo, Polychrome Jar, late 20th-early 21st century, Natural hand-harvested clay and slip, Gift of Joan H. and John B. Carley, Boise Art Museum Permanent Collection.